Available from Central Vacuum Direct. Replacement Foot Pedal Release for Beam Aero III, Butler, and Classic model power nozzles. Will also work with M&S MS1199, Nutone 399, and other power heads. The Beam Q Adapter Attachment will change the oval extension wand into the standard round central vacuum wand. This will enable a homeowner to utilize all of the previous attachments previously owned, plus various other attachments that Beam does not manufacture. This is the genuine Beam Rugmaster Cord New Style 2 Prong for your Beam Rugmaster power nozzle. Cord installs into the Beam power head then connects to the extension wand. Genuine Beam 5.7" rubber motor gasket. This will fit many Beam, Electrolux, Frigidaire, and Honeywell central vacuum models. Click for a list of compatible models that this will work with. Available from Central Vacuum Direct. 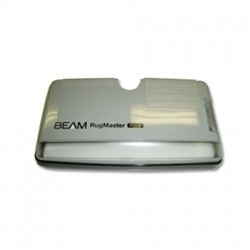 Replacement Beam Rugmaster Belt will fit many Beam and Eureka power heads. Replacing the belt helps increase the drive ability of your brush roll which, in turn, keeps your floors and home cleaner. (2 pack). Genuine Beam anti vibration upgrade kit for power units. 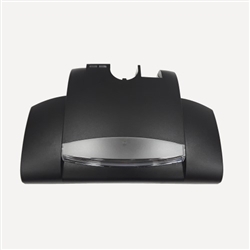 Designed to be used with the mounting bracket to reduce the vibration of your central vacuum main unit. Will fit all Beam, Electrolux, Frigidaire, and Honeywell central vacuums. Available from Central Vacuum Direct. Replacement Beam Aero III & Beam Butler Wheel central vacuum power nozzle. Replacement wheel will easily snap into place on old power nozzle. These Beam Q Foot Pedals are for the Beam Q power head. Kit comes with both foot pedals and necessary springs. Replacement Beam Rugmaster Wheel. Service note: When using this wheel for a Beam Advocate power nozzle you will have to remove 1/4" from the post that holds the wheel in place on the nozzle base to get it to lock in place; the original wheels have been discontinued. Why replace the whole power head when you can just replace the broken part? Reach your vaulted ceilings easily with this lightweight plastic wand. This 19" wand will fit all 1-1/4" hoses and attachments. This is a genuine replacement Beam Imperial Neck Assembly for the Beam Advocate, Imperial, and Solaire power heads. Assembly does not include any wiring. This is the plastic neck assembly only. Genuine Beam Atlis intake seal and bag upgrade kit. This kit will tighten the intake seal on your power unit and allow you to use a disposable bag making it less messy when you empty the dust bucket. Click to find out which models this is compatible with. Available from Central Vacuum Direct. This is the replacement Beam 3"x5" Central Vacuum Exhaust Filter. The exhaust filter is located inside the machine and should be replaced about once a year. Available from Central Vacuum Direct. 76" black power cord assembly, 240V for Beam 3067, 677, 3500, and Ecopure 401. Replacement Beam Rugmaster Upper Wand for the Beam Rugmaster Power Team series. Don't let your power team go to waste, simply repair the broken parts and be on your way! Available from Central Vacuum Direct. Genuine Beam wall mounting bracket. Will work for all Beam, Electrolux, and Honeywell power unit models. Available from Central Vacuum Direct. PPC intake replacement kit small diameter for Beam 189, 189C, 189D, 189S, 199C, 199D, 199E, 199F, 297F, 299A, 2089, and 2100. Includes: 45 degree elbow, grommet, 22 degree intake elbow with slot. Available from Central Vacuum Direct. This power switch will work on any Beam Rugmaster Plus power nozzle with a switch, and many other models as well. Available from Central Vacuum Direct. Replacement Beam Central Vacuum Serenity front Wheel and Axle set. Just one of Beam's many high quality replacement parts. Complete set. Package of 3 Genuine Beam 5 gallon central vacuum bags. These bags are designed specifically for the Beam model 167 central vacuum. Replacement Beam Advocate and Solaire Belt. Will work on select Electrolux, Eureka, and Honeywell power nozzles as well.This genuine Beam Advocate belt is geared and reinforced. Replacement Beam Rugmaster Brush Cover for the Beam Rugmaster central vacuum power head at Central Vacuum Direct. This cover for the Beam Rugmaster is located within the power head itself. It covers the brush roll and is easily installed. Beam Rugmaster 3 Prong Cord at Central Vacuum Direct! Available from Central Vacuum Direct. Beam Swivel Neck 155459 for Rugmaster Plus, Classic 1, and Eureka CV205 power nozzles. Exact replacement part for your Rugmaster power head. Made from durable plastic. Rear Wheels for the Beam Solaire and Advocate power nozzles. Will also work on Electrolux EXL103A, EXL1250, EXL1350, Eureka ECP700E, and ECP750E models.These are genuine Beam central vacuum parts. Replacement Beam Rugmaster Old Style 2 Prong Cord. This cord has a different shape on the prong side end as the new style 2 prong cord. Make sure you note the difference before purchasing. Replacement Beam Quick Release Power Nozzle Cord for the Beam quick release system. Side with prongs plugs into extension wand bottom, exposed wires are connected internally into the power nozzle. Available from Central Vacuum Direct. 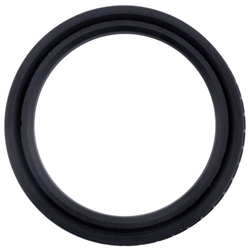 Genuine Beam Alliance Motor seal gasket. Will fit the following Beam Alliance models: 600SA, 650SB, 650TB 700TB, and 700TC. Available from Central Vacuum Direct. Easily replace the Beam Solaire Bottom Plate. This is a genuine Beam replacement part made for the Beam Solaire. This part will clip in where broken bottom plate is. ***Service Tip: If you hover you cursor over the picture and your old bottom plate has five tabs (Imperial and Advocates) you will need to shave off the center tabs of the replacement plate and the half of outer half of the tabs next to the center most tabs for the new plate to fit. The five tab plate has been discontinued. *** Replacement Beam Q Height Adjustment. This central vacuum part installs into the new Beam Q style power nozzle and adjusts the height of the brush. This is a replacement part only. Keep your Beam central vacuum running at peak performance with the Beam Central Vacuum 6 Gallon Bags. These bags are designed to work with your Beam central vacuum system flawlessly, helping you keep a cleaner, healthier home for your family. There are 3 bags per package. Replacement Eureka CV Series Central Vacuum Bags for Eureka central vacuum systems. These bags remove 97.8 percent of dust and allergens, helping keep your home clean and healthy. Beams unique feature of using a paper bag with their permanent bag system is a great way to add extra power to your Beam central vacuum unit. An adaptor is required. (The adapter comes free with the 110073 kit). As with all Beam products you can count on quality and value. Includes 3 bags per package. 2 hole type bags. This Beam Universal Telescopic Wand with button lock is universal with 99% of central vacuum systems. The friction fit at the bottom allows you to use a variety of attachments such as a hardwood floor brush, dusting brush, and more! This is the replacement Beam Solaire Power Head Neck for the new style Beam Solaire power head. It is oval at the top, as opposed to the old round style Beam Solaire. This is the replacement neck for the new style Beam Q power head. It is oval at the top, as opposed to the old round style Beam Q power heads. Neck Assembly for Beam Serenity and Wessel Werk EBK340 Power Nozzles Replacement Beam Solaire LED PC Board with wire for the Beam Solaire power nozzle. This particular PC board is located within the housing and can be replaced by a do-it-yourselfer. Genuine replacement Beam Advocate Brushroll. This brushroll has high quality bristles that deeply agitate carpet for a cleaner home. Genuine replacement brushroll for the Beam Solaire power nozzle. This brushroll has high quality bristles that deeply agitate carpet for a cleaner home. This replacement Beam EZ Change Neck Assembly was common on some Beam Rugmaster, Imperial, Solaire and Advocate power heads, but was also installed on other versions of various brands including the Eureka CV205. If you are unsure if this is the part you need, feel free to contact us. The Beam Central Vacuum Bags and Adapter Kit is a great way to add the dual bag option to your Beam central vacuum unit. The kit includes 3 bags and 1 adapter per package. Simple to install, this kit adds the power you need to clean your home like a pro. Extra bags can be purchased separately (110057 3 bags per package). The Beam Rugmaster 155451 Wand Old Style is a solid metal extension wand The 155451 Beam upper wand is the replacement for the Beam Rugmaster wand at Central Vacuum Direct. Replacement Beam Solaire Cogged Belt 2 pack for the Beam Solaire power head at Central Vacuum Direct. 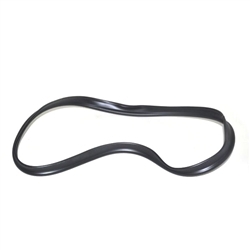 Cogged belts last a lot longer than normal rubber belts and can last up to two years without needing replacement. Replacement Beam Serenity wand for the Beam Serenity power head. This wand will work with Beam Serenity power heads that have the cord coming out of the back of the power head, as opposed to the new style with the cord integrated into the neck. Changed to new #60858-1 or #155528. Fits all Beam Butler Power Nozzles. Models BM1195 and BM1197. Replacement HEPA filter cartridge for central vacuum systems. To be used with the HFC9 HEPA filtration system. Replace every year for optimum filtration. Beam Serenity Power Nozzle Micro on/off switch. Genuine Beam Serenity 2 Prong Cord replacement cord for the Serenity powernozzle. This cord attaches at the base of the Serenity powernozzle, then is stretched up to the handle of the hose where it is plugged in. Genuine replacement Beam Q Brushroll with Bottom Plate for the Beam Q powernozzle. This Beam Q brushroll has high quality bristles that agitate the carpet to clean deeply. Kit comes with brushroll, replacement belt, and bottom plate. The Beam Q motor fits Electrolux quiet clean power heads also. This is the genuine main printed circuit board for the Beam Q100, or Electrolux EL7061, EL6988E, EL7057 models. Base assembly for Beam; Aero, Butler, and Classic, Eureka CV190A, Nutone 599, and M&S Filtex MS1199 Power Heads Replacement Beam and Electrolux telescopic wand for the Beam Advocate. Imperial, Electrolux EXL1250, and EXL1350 power nozzles. This wand is steel and comes with attached cord. EZ change release makes it possible to switch quickly from the power head to any other attachment. Beam Q Wand from Central Vacuum Direct. The Beam Rugmaster Wand Old Style 3 Prong is a solid metal extension wand with integrated wiring for an electric power head. The wiring is for power heads with 3 prongs and is the replacement for the Beam Rugmaster wands at Central Vacuum Direct. This high quality, steel Beam Rugmaster Brush Roll is designed to be used with the Beam Rugmaster and Eureka power heads. The replaceable brushes make it easy and cost effective to keep cleaning your home efficiently! Replacement Beam EZ Change Lower Wand New Style 2 Prong for the new style Beam Rugmaster power head. This wand has the same EZ-change assembly, but has 2 prongs instead of 3. Base for Beam and Eureka power nozzles. Fits Beam Advocate and Imperial models, as well as Eureka E1403EZS models. 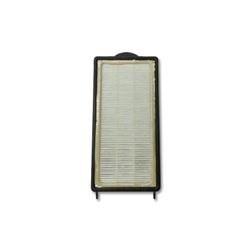 Made from the finest materials, this top quality exhaust HEPA Filter has a charcoal membrane. The Beam 110371 Filter is OEM for your Beam SC300A, 2067, and 2700 models. Replacement Beam New Style Rugmaster Motor for the Beam Rugmaster power nozzle. This motor will work with all newer style Beam Rugmaster & Eureka Power Heads. Genuine Circuit Breaker with lens. Fits Beam Advocate AP900, Eureka E1403EZS, Electrolux EXL1250, and EXL1350 models. This is the replacement Beam Serenity Power Nozzle Circuit Board. It will work with all the Beam Serenity power nozzles that were available from 2000-present. Replacement circuit board #100562 for Beam central vacuum systems. This PC board kit comes with all the necessary wiring and plugs to change your existing central vacuum PC board. This neck is the genuine Beam Serenity Power Nozzle Neck. The neck includes internal wiring that gets connected to the power nozzle. Note: Will only work for Beam SERENITY power nozzle. Common Beam 120V PCB for single motor units. This circuit board will fit many popular central vacuum models. Click to see model numbers that this is compatible with. Available from Central Vacuum Direct. Replacement circuit board #101111. Replacing a PC board in your central vacuum is relatively easy and can be done by most people who are moderately handy. Replacing a PC board usually takes about 30-45 minutes and requires minimal tools. Replacement circuit board #101112. Replacing a PC board in your central vacuum is relatively easy and can be done by most people who are moderately handy. Replacing a PC board usually takes about 30-45 minutes and requires minimal tools. Replacing a Beam 750A Circuit Board is relatively easy and anyone with even minimal handy experience can do it. The Beam 750A Circuit Board fits many different central vacuums, including Beam, Honeywell, & other brands. Wessel Werks hood w/lens for all EBK340 power nozzles. Will work for all EBK340 power heads: Beam Serenity, Chateau, Honeywell H400, and others manufactured by Wessel Werks with the EBK340 model number. Available from Central Vacuum Direct. Genuine Beam printed circuit board (PCB) for the Alliance series power units. Will fit the following Beam Alliance models: 600SA, 650SB, 650TB 700TB, and 700TC. Available from Central Vacuum Direct. Genuine Beam printed circuit board (PCB) for 120V Intelliwatch Power units. Designed for use specifically in the following Beam models: CV199 Millenium Edition, 2250C, and 2250D. Available from Central Vacuum Direct. Replacement motor for the Beam Serenity EBK340 power nozzle. This motor has a geared axle for a cogged belt and is very easy to change out. Homeowners with very basic do-it-yourself skills can easily repair this power head. Genuine Lamb 2 stage 240V motor. This motor is specifically designed for use in the Beam model 677 power unit. Although this is Beam's most inexpensive power head, it is not a low quality unit. The Beam Classic ll will perform beautifully in all situations. The floating height design and over molded wheels transfers from rugs to bare floors instantly. The rubber bumpers protect molding and furniture. Beams Classic ll is just what the name implies, a classic power head. Genuine 3 stage 120 volt Lamb central vacuum motor. This powerful motor will fit in a wide variety of popular models. Click for more information like models that this is compatible with and technical data. Available from Central Vacuum Direct. Available from Central Vacuum Direct. Genuine Beam Alliance 600 series motor assembly. Will fit the following Beam Alliance models: 600SA, 650SB, and 650TB. Available from Central Vacuum Direct. Genuine Beam Alliance 700 series motor assembly. Will fit the 700TB and 700TC model Beam alliance power units.